Learn about the differences between Cloud Services and Service Fabric before migrating applications. 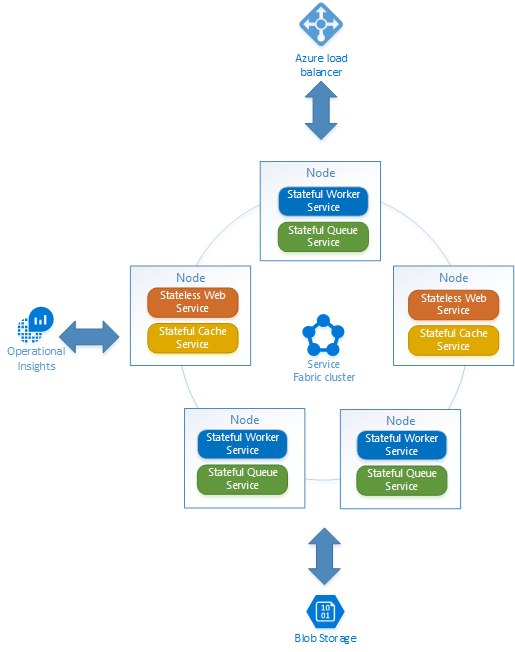 Microsoft Azure Service Fabric is the next-generation cloud application platform for highly scalable, highly reliable distributed applications. It introduces many new features for packaging, deploying, upgrading, and managing distributed cloud applications. 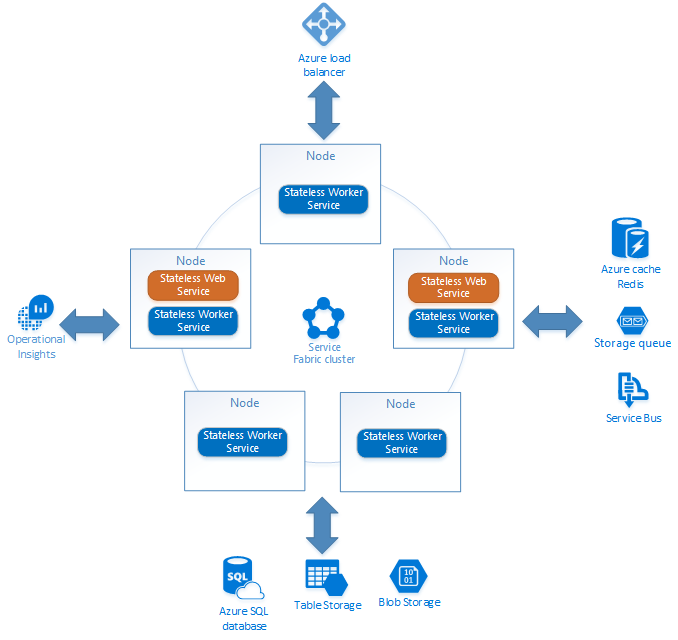 This is an introductory guide to migrating applications from Cloud Services to Service Fabric. It focuses primarily on architectural and design differences between Cloud Services and Service Fabric. A fundamental difference between Cloud Services and Service Fabric is the relationship between VMs, workloads, and applications. A workload here is defined as the code you write to perform a specific task or provide a service. Cloud Services is about deploying applications as VMs. The code you write is tightly coupled to a VM instance, such as a Web or Worker Role. To deploy a workload in Cloud Services is to deploy one or more VM instances that run the workload. There is no separation of applications and VMs, and so there is no formal definition of an application. An application can be thought of as a set of Web or Worker Role instances within a Cloud Services deployment or as an entire Cloud Services deployment. In this example, an application is shown as a set of role instances. 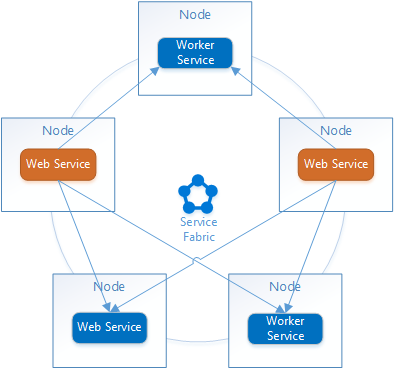 Service Fabric is about deploying applications to existing VMs or machines running Service Fabric on Windows or Linux. The services you write are completely decoupled from the underlying infrastructure, which is abstracted away by the Service Fabric application platform, so an application can be deployed to multiple environments. 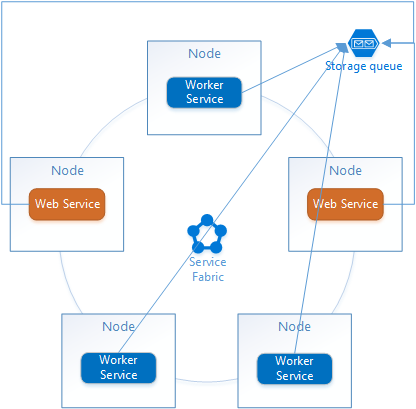 A workload in Service Fabric is called a "service," and one or more services are grouped in a formally-defined application that runs on the Service Fabric application platform. Multiple applications can be deployed to a single Service Fabric cluster. Fast deployment times. Creating VM instances can be time consuming. In Service Fabric, VMs are only deployed once to form a cluster that hosts the Service Fabric application platform. From that point on, application packages can be deployed to the cluster very quickly. High-density hosting. In Cloud Services, a Worker Role VM hosts one workload. In Service Fabric, applications are separate from the VMs that run them, meaning you can deploy a large number of applications to a small number of VMs, which can lower overall cost for larger deployments. The Service Fabric platform can run anywhere that has Windows Server or Linux machines, whether it's Azure or on-premises. The platform provides an abstraction layer over the underlying infrastructure so your application can run on different environments. Distributed application management. Service Fabric is a platform that not only hosts distributed applications, but also helps manage their lifecycle independently of the hosting VM or machine lifecycle. Service Fabric applications can also choose to use the same external services in a complete application. Using this example Cloud Services architecture, the simplest migration path from Cloud Services to Service Fabric is to replace only the Cloud Services deployment with a Service Fabric application, keeping the overall architecture the same. The Web and Worker Roles can be ported to Service Fabric stateless services with minimal code changes. Unifying the deployment, management, and upgrade models. Most Cloud Service applications consist of more than one tier. Similarly, a Service Fabric application consists of more than one service (typically many services). Two common communication models are direct communication and via an external durable storage. With direct communication, tiers can communicate directly through endpoint exposed by each tier. In stateless environments such as Cloud Services, this means selecting an instance of a VM role, either randomly or round-robin to balance load, and connecting to its endpoint directly. Services in Service Fabric are not bound to the VMs that host them; services may move around in the cluster, and in fact, are expected to move around for various reasons: Resource balancing, failover, application and infrastructure upgrades, and placement or load constraints. This means a service instance's address can change at any time. A VM in Service Fabric can host multiple services, each with unique endpoints. Service Fabric provides a service discovery mechanism, called the Naming Service, which can be used to resolve endpoint addresses of services. A common communication mechanism between tiers in stateless environments such as Cloud Services is to use an external storage queue to durably store work tasks from one tier to another. 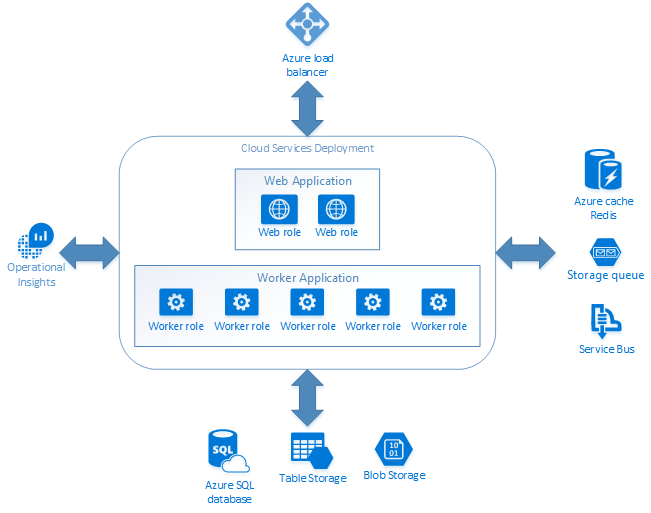 A common scenario is a web tier that sends jobs to an Azure Queue or Service Bus where Worker Role instances can dequeue and process the jobs. The same communication model can be used in Service Fabric. This can be useful when migrating an existing Cloud Services application to Service Fabric. The simplest migration path from Cloud Services to Service Fabric is to replace only the Cloud Services deployment with a Service Fabric application, keeping the overall architecture of your application roughly the same. 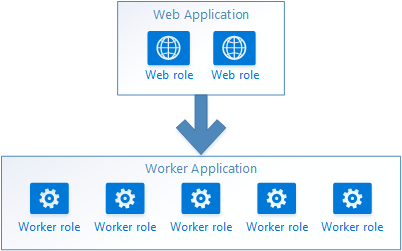 The following article provides a guide to help convert a Web or Worker Role to a Service Fabric stateless service.